It is A Paper Pumpkin Thing Thursday! Where myself and a bunch of Stampin' Up! Friends get together to show you alternate ideas for each months kit! This months kit was SUPER awesome! Why?? Well because this months kit coordinated with the Broadway Bound Suite in the Annual Catalog. Usually I share the projects that are submitted to Paper Pumpkin for their blog post or at least one... but I loved this kit so much I wanted to make MORE!!! The fabulous color combination of Lemon Lime Twist, Lovely Lipstick, Basic Black and Gold is so much fun! The DSP alone screams SASS! We all know I have a little girl with a WHOLE lot of Sass! Let me show you my projects. 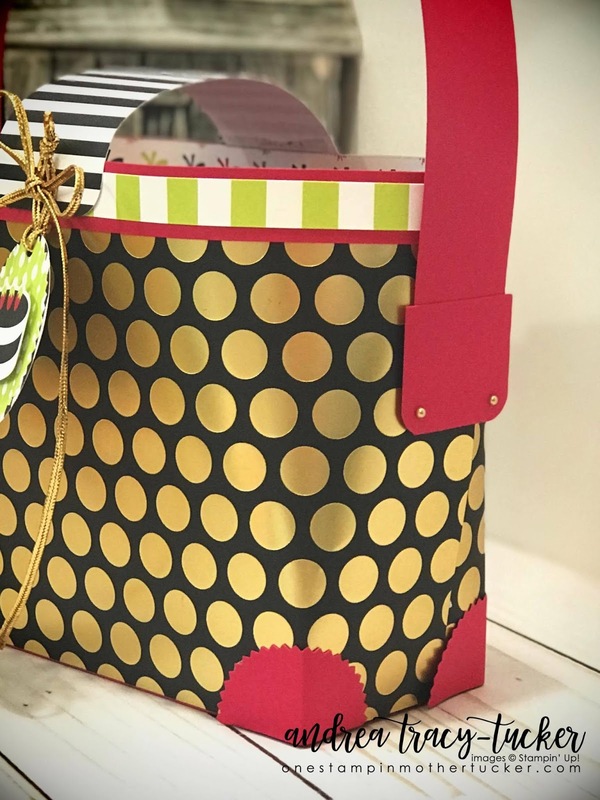 I knew the minute I opened the pack of Broadway Bound DSP that the large Gold Foil Polka Dot was begging to made into a large tote! It actually took up a WHOLE sheet!! With Lovely Lipstick Starburst Punch corners and a Lemon Lime Twist and White Stripe matted with Lovely Lipstick border, I am sure I would find this the next time I was at the mall! I did a nice closure with the card base from the Paper Pumpkin kit and tied a nice Gold Cord bow adorned with nice Cake Tag made from elements of the kit! My card came along nice and easy! 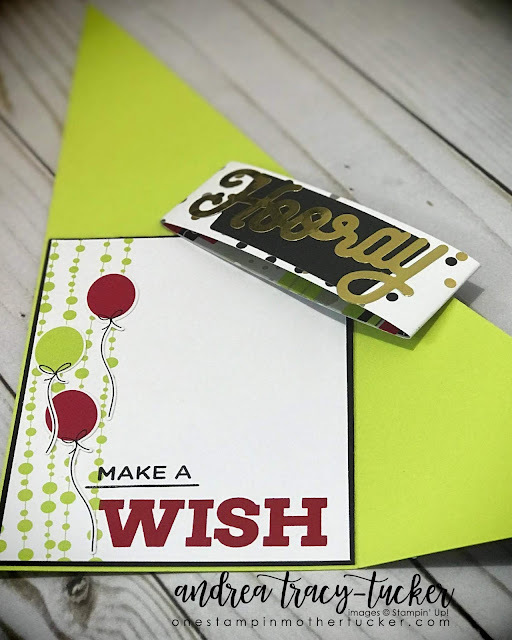 I received an email from Splitcoast Stampers with a tutorial of the card base from Dawn Olchesfke. I used a Lemon Lime Twist Base then used the card base for the pattern on the front. I added a belly band to keep the card closed and added the Gold Foil Hooray from the kit. When it opens the stamped sentiment is from the Broadway Birthday Stamp Set. It was stamped on an envelope from the kit and accented with a few of the balloon stickers much like the front! Thank you so much for stopping by today! I can't wait for you to see what the rest of my friends have come up with! You can tour the whole hop by clicking through the list below! Your projects are awesome!!! I really love the bag, so cute! I love your projects, they are very cute. Such cute projects! Thanks for sharing your ideas. Fun ideas! I'll have to try that card idea for my stamp club. Thanks for sharing!